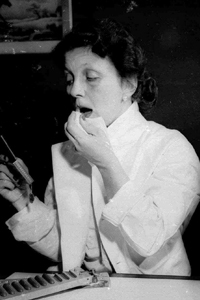 Make-up History – Hazel Bishops Stay-on Lipstick . The First Permanent lipstick invented by a forgotten genius. When you think of make-up innovations, you immediately call to mind Max Factor, and rightly so. accessory, rather than a necessity. However, by 1950, a survey found that two thirds of women wore lipstick all day. Keeping it in place of course was a nightmare. Women were spotted everywhere, hurriedly re-applying their lippy at bus-stops, train stations, waiting for taxis or standing in elevators. It was – needless to say – stressful. but one woman, and it’s probable that it could only have been a woman, came up with the answer in 1949. Her name was Hazel Bishop. Born in 1906, she graduated from the Bergen School for Girls in Jersey City, New Jersey., attended evening classes in Columbia University and became an organic chemist. In the 1930s she took a job as an assistant in a dermatological laboratory at the College of Physicians and Surgeons. There she worked with A.B. Cannon, who, with her help, would later launch the hypoallergenic cosmetics line known as Almay! During the war, she worked for the Standard Oil Development Company and quickly advanced through its ranks, specializing in aviation fuels for long flight bomber missions. spent evenings, conducting hundreds of experiments, until she finally nailed it. was looking for. The product was ready for launch by 1949.The main ingredient was bromo acid. was the ruler of all thinking, and there were no regulations on ingredients. 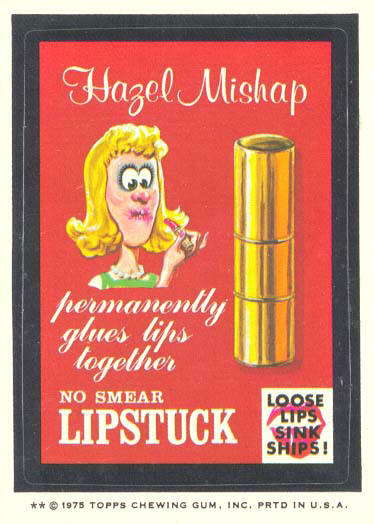 Bishop had nevertheless produced the worlds first lipstick that stayed on till you took it off ! 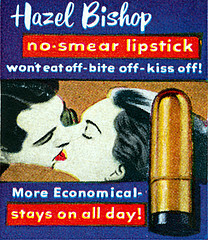 Quickly forming a company, using the business acumen she had learned from her parents, she launched her lipstick, with the help of Raymond Spector, an advertising executive she had brought in as a financing partner, Sales by Hazel Bishop Inc of the new stay-on, non-smear lipstick increased from $49,527 in 1950 to $10,100,682 in 1953 – an incredible achievement. The Stay-on lipstick took the world by storm. 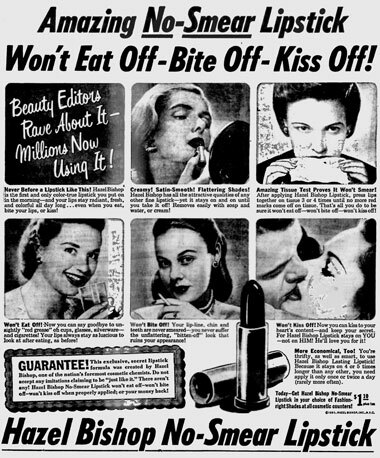 was in black and white.Such was the impact, the leading lipstick brand at the time, Revlon,introduced an ‘Indelible-Creme Lipstick’ in 1951 followed by a ‘Non-Smear Lipstick’ in 1953.
big names in cosmetics. Sadly it was not to be, at least not for its founder. Unhappy with the direction the company was being led, by its chief executive and principle shareholder, Raymond Spector, she lost all control of her baby in a lawsuit. Her cash settlement was $310,000, and she lost the right to use her own name. Bishop often asserted that women have an understanding of cosmetology that a male chemist could never have ! She advised women to ” accentuate their most attractive feature – the mouth “, and – oddly for such an independent woman, maintained that ” young women’s looks were more important than whatever drive and intelligence they might possess .” Strange. Perhaps, her point was to assert your feminine power ! Bishop never ran a successful cosmetics firm again, but became an expert in stocks and shares in the cosmetics industry. In the 1980s she became the Revlon Chair of Cosmetics Marketing at the Fashion Institute of Technology. 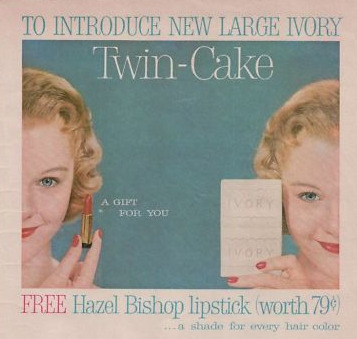 Ironically, it was with Revlon lipsticks that Hazel Bishop Inc had locked horns back in 1953. She passed away in 1998 at the ripe old age of 92. Glamourdaze salutes this innovative woman – Hazel Bishop. Found this funny Wacky Package version of Hazel Bishop here. Now available from Vintage Make-up Guides. Beautifully restored and illustrated 1920’s,1930’s,1940’s,1950’s and soon 1960’s make-up guides as actually taught to women in those glamorous eras. They’re a treat to have and read ! The 1950's was such an amazing decade and your blog is lovely and a fantastic dedication to that time period. i can't wait for the 60's guide. I guess you will include it the bundle but could you please make a special price on this guide for people who already purchased the bundle make up guide?